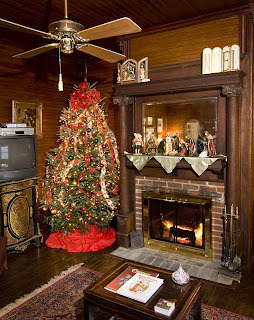 Christmas is one of my favorite times of year and is even more so since we moved to the Inn. There is something so special about decorating an older home. The Mountain Rose has always had character to me and at the holidays, with all the lights, greenery and ribbon, it just seems to shimmer and glow with its happiness. We were delighted to have a group from the Roanoke County Parks and Recreation tour the Inn during Christmas. 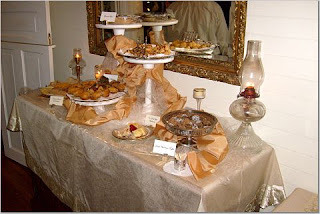 After the tour, we treated them and ourselves to a yummy dessert buffet. A special treat for us this Christmas was the visit of members of the Whitlow family. 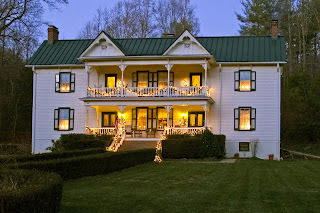 During the 1940s and '50s, Mr. & Mrs. Joe DeHart (the original owners of the Mountain Rose) decided to move to their daughter's home in Stuart, VA. At that time, they rented the Inn to the Whitlow family for several years. It was wonderful to have the descendants of this family visit with us and tell us tales of what the house and property were like during that time. So the warmest of wishes to you and yours for a very Merry Christmas. Happy Celebrating of the Blessed Season!